I sent my 3 children to Adam Lamb and my children and I loved it. I can't emphasize enough how well Adam Lamb prepared my children for kindergarten. I could tell during kindergarten orientation that my children compared to other children in their kindergarten class were already at an advantage. By having this base knowledge their school experience has been wonderful and an easy transition. They enjoy school. The teachers my children had were patient, kind, and encouraging. Everything you look for in a preschool teacher. I also loved how Adam Lamb incorporated Gods love into their program. It was a perfect combination of preschool and religious education. I'm very grateful that my children got to experience Adam Lamb. I cannot say enough good things about Adam Lamb preschool. Over the past 8 years 3 of our children have attended Adam Lamb preschool, and I am so sad to be saying goodbye to the smiling, sweet staff members as our youngest heads off to kindergarten. However, I know that my youngest just like her older brothers will be ready to begin her elementary career thanks to the dedicated staff members of Adam Lamb. Adam Lamb is the perfect combination of a nurturing, loving environment mixed with strong academic expectations. Not only did my kids learn all of the necessary academic skills to be successful in kindergarten; they learned also about God and the love he has for them. Another wonderful aspect of Adam Lamb preschool is the different programs and flexible schedules that are offered during the preschool years. We were able to make the right fit for each of our children with the input of the staff and our needs as a family. Each of our children left home excited to go to school to learn, play with friends and be loved on by their teachers. In the words of my youngest child, "I wish we could start the alphabet again so I could go to start school over again." One of my favorite things about Adam Lamb as an educator is that they offer two different programs for second year preschool children. My older children are graduates of the Pre-Kindergarten program which is a more traditional three half day program that was excellent preparation for their continuation into elementary school. My five year old is currently enrolled in the Junior Kindergarten program. This program is for children that have fall birthdays and/ or would benefit by developing learning skills at an accelerated pace. These options support student learning for all children to reach their academic potential. As a parent and educator I would highly recommend Adam Lamb Preschool to anyone that is looking for their child to have an excellent preschool experience while developing a lifelong love of learning. Thank you, Adam Lamb, for preparing my children and hundreds of others. I am a physical education teacher at Immaculate Conception Catholic School. When trying to decide where to send my daughter to pre-school I asked the kindergarten teachers where they suggested she go. It was a unanimous "Adam Lamb". They told me that the kindergartners that come from Adam Lamb do excellent and that it's evident where they went to pre-school. That was all I needed to hear. My daughter is currently enrolled in the Junior Kindergarten class and in the six weeks she's been there I am astounded by how much she has learned! She knows the months of the year and days of the week in order, can count to 100 without any help from me and her phonics knowledge is great! There is no doubt in my mind that I made the best decision by enrolling her at Adam Lamb and would highly recommend any parent with preschool age children to do the same. My name is Amy Steinhoff, and I am a kindergarten teacher at Pheasant Point Elementary in the Fort Zumwalt School District. I LOVE Adam Lamb Preschool and feel that the teachers and staff really prepare their students for Kindergarten!! The incoming Kindergarten students in my classes who come from Adam Lamb Preschool know what they need to know in order to be successful in Kindergarten. I even sent my own 2 daughters to Adam Lamb Preschool and I loved it just as much as a parent. The teachers follow a curriculum and they make learning fun for the kids. They really care about each child and the children LOVE their teachers. It is also very reasonably priced! 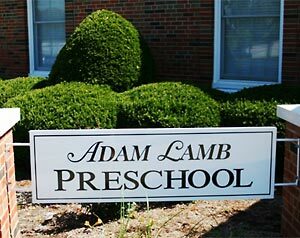 So, if you are considering a preschool for your child, choose Adam Lamb Preschool! I have been a private school principal for 25 years and during that time I have learned to differentiate between day care centers, average preschools, and truly extraordinary early learning environments. Adam Lamb falls into the latter category. The philosophy and practice at Adam Lamb can be described as nurturing, family friendly and educationally appropriate. While many educational institutions flit from one educational fad to another, Adam Lamb has always struck me as an organization that pays attention to what works best for each individual child. In other words, they don’t try to fit the child into any educational worldview but, instead, build a program around the individual child. We have accepted many young people over the last five years to our school, Andrews Academy Lake Saint Louis, and each youngster coming from Adam Lamb has been an asset to our student body. They are prepared in all ways, especially in their budding sense of curiosity, willingness to learn, and cooperative natures. I wholeheartedly recommend Adam Lamb to any family wanting the very best for their preschool child. I would highly recommend Adam Lamb Pre-School to anyone who is looking for a fun, safe, enriching and loving environment for their child! The staff at Adam Lamb is very caring, devoted and educated. The entire pre-school program is a well-rounded program that provides a strong Christian foundation for children! I am a pediatric occupational therapist and have two children that have been enrolled in Adam Lamb Preschool. My five-year-old son is a graduate of Adam Lamb. He attended Mothers Day Out at Dardenne Presbyterian Church, followed by two years of pre-school. My three-year-old daughter currently attends Adam Lamb as a first year preschooler. She also attended the Mother's Day Out Program at the church. I have been extremely satisfied with Adam Lamb’s curriculum-based programming that teaches strong pre-academic skills. The program offers great opportunities for the children to socialize, learn through sensory play, gain motor skills, increase their desire for learning and learn about God and his word. When my son graduated from the pre-kindergarten class, he had learned site words, created sentences and was able to label drawings to tell stories. He had strong skills in counting and simple math, identifying letters and their sounds and had developed good listening skills from a strong classroom routine! He was definitely ready for kindergarten. Adam Lamb has helped to build those essential skills that every child needs for kindergarten and beyond.